Safari/Gold has dense gold microfleck shimmer in an army green jelly base. Feels good to start the new year off with an ugly green. Sorry, Nichole! This is three coats because of the jelly base. I'm torn about whether it needs undies or not. I don't like that hint of VNL, but at the same time I'd be sad to lose the depth. It reminds me of LA Colors Cactus, and I have the same mixed feelings with that one. 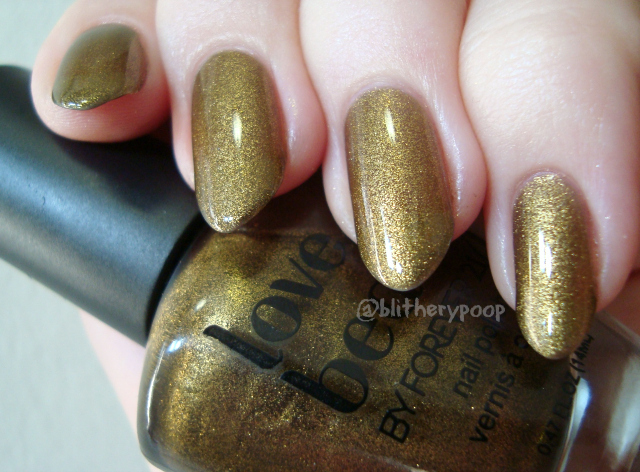 Have you bought any of the newer Forever21 polishes? Any recommendations? Ooh, this is a pretty/ugly polish. I actually quite like it on you!